The Teraflex Front Lower Sport Flexarms are specifically designed for Jeep Wrangler JLs with 2.5” of lift. These fixed length control arms offer full articulation, and will not limit suspension flex when off road. By using high-quality factory style bushings Teraflex is able to reduce noise, vibration, and harshness (NVH). They require zero maintenance, and are easy to install. Teraflex Flexarms are sold in pairs, and carry a limited lifetime warranty. Fixed Length Control Arms: The Teraflex Front Lower Sport Flexarms are optimized for use with 2.5” lifts. When used with a less lift they will give more caster, and with more lift they will give less caster. The factory style bushings are designed to reduce noise, vibration, and harshness (NVH). 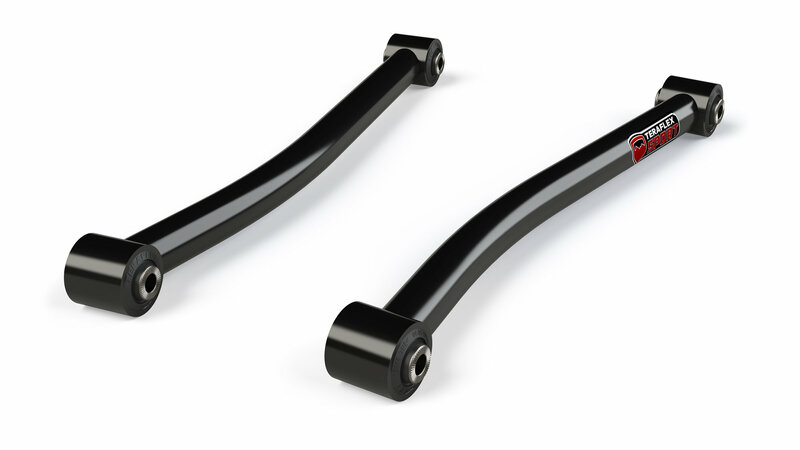 Heavy Duty Construction: These control arms are made from durable Drawn Over Mandrel (DOM) tubing which is finished with black e-dipped coating.